Finding the best chainsaw you can buy can be a daunting task for a first-time buyer. The choices are vast and comparing the vast list of features has so many variables. Limiting your choices to gas as a power source still leaves you with a long list of features. All you want is to cut down some trees and prepare firewood. But which bar and chain will do the job? Should you use an electric chainsaw? Battery power? Or gas? But gas is so noisy, smelly and requires a lot of maintenance. How important are the different features? For instance, is the weight of a chainsaw important? To the female landscape artist who prunes trees, brush, and shrub, it matters a lot. For heavy-duty all day tree felling, you expect the chainsaw to be heavy because it is big and powerful. But so what? You are the powerful, fit, outdoor type anyway. You’ll most likely appreciate a lighter chainsaw but will not want to lose out on anything. Power matters to the lumberjack, more is better. To buck firewood it matters, but not for pruning. So, what is the best chainsaw you can buy? It depends on the application, doesn’t it? Even to the extent of the build quality of the chainsaw. If you’re looking at pruning a few garden trees once a year, that’s not too important. The price and convenience may be more important. But, for the guy who uses it all year round, every day, durability really matters. We’ll review the best chainsaws property owners can buy, and will be looking at all three power sources. There are two corded chainsaw models for those who prefer the convenience of plug and go and appreciate the low noise, no-nonsense cutting and limbing. You do not use the chainsaw daily and prefer to avoid gas storage and maintenance issues. We’ll also look at two powerful cordless models. Perfect, if you like the convenience of electricity, but you’d prefer not to drag a cord behind you. Cordless chainsaws are very capable. Their brushless motors last forever. You can also swap out batteries and extend your time cutting and limbing. Gas chainsaws are for heavy duty wood cutting. For someone who owns a plot in the forest, with big projects and large trees to cut. Especially if your neighbors aren’t close, a noisy chainsaw is less of an issue, when you consider the efficiency and greater power. Which one is best? Gas, battery or electric? The chainsaws that we’ve selected have bar lengths from 14 inches to 20 inches. Perfect for homeowners. You measure the length of the bar, rounded to the nearest inch, from the front of the saw to the tip of the farthest cutter. Saw bars suitable for homeowners measure between 10 inches and 20 inches in length. As I mentioned, we’ve selected corded electric, cordless and gas chainsaws. In comparing them, some of the advantages and disadvantages are quite obvious. But, comparing them not so straightforward. Gas-powered chainsaws are rated by engine size, ranging from 32cc to 121cc capacity. Corded electric saws are specified by the amperage they use, ranging from 8 to 15 Amps. And cordless chainsaws are specified by the voltage of the battery, from 18 to 120 Volts. So, the question arises, how do we compare them? One way of comparing the power of these chainsaw types is by considering the bar length. If you buy an 18-inch chainsaw, be it gas, corded or cordless, you expect to cut wood of at least 18 inches. So, the power source must be able to provide the necessary power for the job. 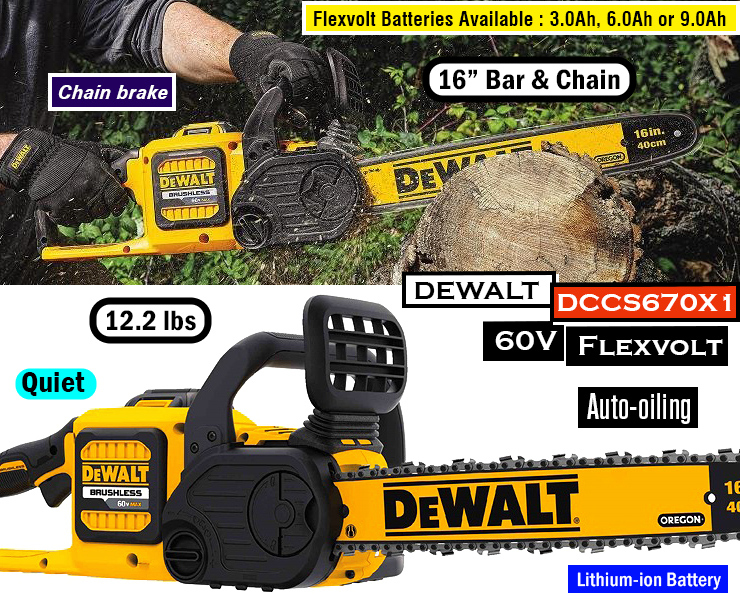 The key to comparing chainsaws with different power sources is in the bar size. The gas-powered chainsaw will have a 42 cc engine. Black+Decker CS1518 : 18″, 15 Amp motor. As powerful as a small gas chainsaw. Professional-grade chainsaw. The Makita UC3551A 14″ and the UC4051A 16-inch Electric Chainsaws have a chain speed of 2,900 FPM. 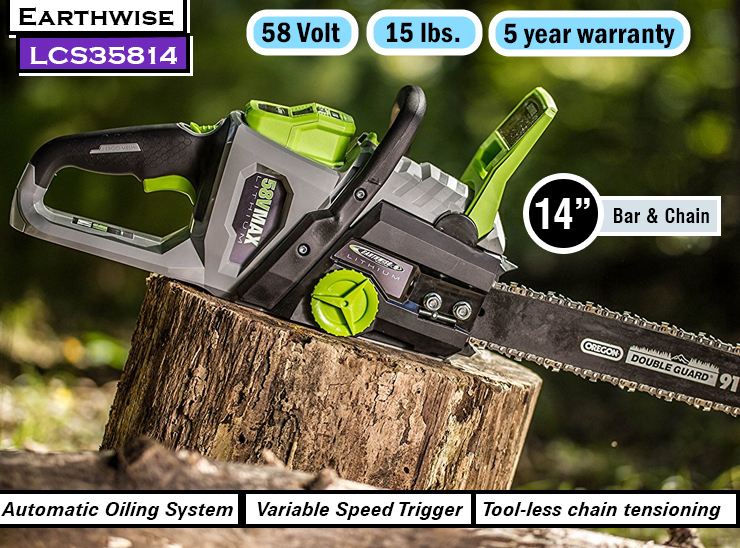 Its chain speed is on par with the rest of the electric chainsaws, but has 74% of the chain speed when compared to the gas-powered Husqvarna 455. It’s 20% slower than the Jonsered 18-inch gas chainsaw. This means the electric chainsaws will cut slower than the two gas chainsaws if the same type of chain is used. The same as running the Husqvarna at 74% of its full speed. It not only slows you down, there’s a greater chance of kickback with a lower chain speed. This versatile chainsaw is durable, and the chain is designed with twin cutting corners for improved cutting performance and durability. The chain has low vibrations, improving user comfort. Oil holes in the saw chain help to carry oil around the full length of the guide bar to improve lubrication. This chainsaw is best for homeowners who cut their own firewood and fell trees that are within the capabilities of its 14-inch bar. The same being true for the Makita UC4051A with a 16-inch bar. If you are an experienced user, you can use it to cut trees of considerable size. To reach all corners of your property, you will need a commercial grade extension cord. More information on this is provided in the user manual which I found informative and easy to use. The Makita UC3551A has a feature I always appreciate. It has a device that you conveniently use to make bar and chain adjustments on the spot when you need to, no tools required. Doing this regularly extends chain and bar life. Some chainsaws, like the Husqvarna 455 Rancher, provide a convenient tool for bar and chain adjustments. But, the problem is that it is not always at hand when the chain needs attention, so I tend to neglect it. The two Makita chainsaws are engineered for ease of use, and efficient operation. Typical of corded chainsaws, it is easy to maintain and offers the convenience of working without the hassles of gas. To start the chainsaw, you use a large trigger switch with a soft start function that ensures smooth startups. There is no sudden jerk as the motor pulls with full force on the chain and therefore chain-life is extended. While you cut, a built-in current limiter helps to protect the motor against burnout during those difficult cuts. It reduces power to the motor when the saw is overloaded, and that will let you back off a bit. This Makita chainsaw is advertised as having an electric chain brake. Not knowing what that means I checked the manual and found that the chainsaw is fitted with a normal chain brake. It’s activated when the hand guard is pushed forward, and the chain then stops within 0.15 seconds. At the same time, the power supply to the motor is interrupted. It’s also equipped with a Run Down brake which stops the chain immediately when the ON/OFF switch is released. This is also referred to as an electric brake and prevents the chain from running when switched off. The chainsaw is also fitted with a trigger lockout which prevents the chainsaw from being switched on accidentally. A chain catcher protects the user against injury should the chain come loose or break. What I did not find is an inertia brake. This chainsaw only relies on the hand-operated chain brake. It’s a fact that it takes some force to move the handguard forward. If your hand does not exert enough force on the front guard or slips over it, the chain brake may fail to activate. If you maintain a firm grip of the chainsaw handles and maintain that grip during a kickback, you will not activate the chain brake. Also, when the saw chain is held in the felling position, your hand cannot reach the front handguard to activate the chain brake. I know that even the inertia brake is not infallible, but at least it is an additional safety measure. A large metal spike bumper that grips the material you’re cutting is a handy feature. A large oil reservoir feeds the automatic chain oiler. It has a view window, you can check the bar oil level by merely glancing at it. This being an electric chainsaw, means that there are zero emissions and noise levels are pleasantly low. When storing the tool, you merely clean it and attend to the chain, maintenance is drastically reduced compared to a gas chainsaw. There is also no gas to drain, no need to mix oil into the gas and no gas storage issues. What is the best chainsaw for someone on a budget, who only needs to do light-duty cutting around the yard? This is a great choice for that. A competent inexpensive electric chainsaw for light-duty work. The Black+Decker CS1518 chainsaw has a powerful 15-amp corded electric motor that connects to a 120V outlet. It uses a low kickback bar and chain from Oregon, a leader in bar and chain manufacturing. Kickback forces can result in serious injury, and it applies to all the chainsaws we review. The Black+Decker CS1518 chain brake is activated by the front hand guard. It has a reduced-kickback guide bar, with a small radius tip to reduce the size of the kickback danger zone. Additionally, a low-kickback chain is used. This type of chain has a contoured depth gauge and guard link which allow the wood to ride into the cutter gradually. The low-kickback chain meets ANSI B175.1-1991 kickback performance requirements. The 2,850 FPM chain speed is only slightly lower than the Makita corded chainsaws. Combined with the low kickback bar and chain, it should be a stable chainsaw. Black+Decker rate it as perfect for cutting large branches, pruning branches or limbs, and cutting firewood. It will not cut as fast as a professional chainsaw, but it will be a useful tool for storm damage clean-up. This corded chainsaw is meant for use by the homeowner or for occasional tree felling tasks. Tool-free chain tensioning on a chainsaw that is seldom used makes as much sense as when fitted to a professional chainsaw. It’s conveniently available and easy to use without the need to fetch or to possibly lose an adjustment tool. Some folks do not like it though, so, I guess it is a personal thing. Like the Makita, the Black+Decker has an automatic oiling system and a window for observation of the oil level. An automatic oiling system ensures constant bar and chain lubrication and needs no priming. Use a high-quality bar and chain oil for proper chain and bar lubrication. If you find yourself without bar oil, you may use non-detergent SAE30 motor oil as a temporary substitute. A chain brake is now a compulsory safety feature, so it’s no surprise that the CS1518 has one fitted. It is the only kickback chain brake, and it is the standard design that’s activated by the back of your hand. This chainsaw weighs only 12 pounds, making it the lightest on our list. It is easy to use for pruning, where one tends to use it overhead, something that is never safe. You should always use the chainsaw in a position that will allow your backhand to activate the chain brake when a kickback happens. A guide bar scabbard is supplied with the chainsaw, do not throw it away. Keep it and use it whenever the chainsaw is not in use. A sharp chain, as it should be, is dangerous, and can easily cut someone. It also protects the tips of the chain against accidental bumping when transporting the saw. A commendable addition to the lower part of the back handle is an extension cord retainer. You double the extension cord and insert it into the slot at the end of the handle under the cord. Next, hook the loop of the cord over the cord retainer to ensure that it does not unplug when pulling on the cord. Yes, you do have a cord to contend with, but you have the advantage of low maintenance and endless cutting time. Black+Decker has been in business since Theodore Roosevelt became the first former president to ride in an airplane. They still manufacture power tools, outdoor yard care equipment, and home products. Black+Decker offer a full two-year home use warranty on the chainsaw. Battery-powered equipment offers the freedom of movement of the gas models. There is no cord to drag behind you. It is a popular choice today, and it is no surprise that the same technology is available on chainsaws. Cordless equipment is normally rated by the voltage of the battery. A higher voltage makes the brushless motor stronger, so it is to your benefit. Another important factor,when purchasing battery powered chainsaws, is that you want the battery to last as long as possible. We’ll be reviewing two cordless chainsaws. One with a 40-Volt MAX, 2.5 amp-hour, 90 watt-hour battery, and the other a 60-Volt, 3.0 amp-hour (180 watt-hour) battery. Watt-hour is an indication of the energy stored in the battery. The FlexVolt battery has double the energy of the 40-Volt MAX so it should last twice as long. Fortunately, most manufacturers use a range of batteries that fit many of their cordless tools. So, if you stick to one brand, you can invest in more powerful batteries that will last longer. The 60-Volt FlexVolt battery has 180 watt-hours of energy, compared to the 90 watt-hours of the 40-Volt battery. But, when pairing the 40-Volt chainsaw with a 6 amp-hour or 7.5 amp-hour battery, it will outlast the 60-Volt battery. 40-Volt x 6 amp-hour = 240 watt-hours or 300 watt-hours with the 7.5ah battery. Then the 40-Volt should last about 33% longer with the 6ah battery or 66% longer with the 7.5ah battery. It is one example of how one should do a little math before you decide which battery will last longer. It is not only the Voltage that counts. What is the best chainsaw to spend your hard-earned money on? Well, you can’t go wrong with this Dewalt chainsaw. It has an exceptionally high level of customer satisfaction. Great chainsaw for cleaning up after a storm. The DEWALT FLEXVOLT 16-inch Cordless chainsaw is fitted with a low kickback 16-inch Oregon bar and chain for construction and outdoor cutting applications. The battery is a DEWALT FLEXVOLT 60V MAX Lithium-Ion (3.0 Ah). It gives you 70 cuts of 6″ x 6″ pressure treated pine wood. Which should be enough for most around-the-house trimming and construction work. If you need longer run times, you have the option of fitting the FLEXVOLT 20V/60V MAX 12.0 Ah battery. With the 16-inch bar, you can fell and limb trees of considerable size. But, don’t expect it to be as quick as a powerful gas chainsaw. It is comparable to a 42 to 45cc gas chainsaw with a 16–inch bar. With its brushless motor, it is as powerful as the Black+Decker CS1518 corded chainsaw. This DEWALT cordless chainsaw is equipped with a chain tensioning and bar tightening knob that ensures that proper bar clamping force is applied. Additionally, it offers the convenience of making chain adjustments without tools. The auto-oiling system has a convenient quarter-turn oil cap for quick oil re-fills. An oil level indicator is included on the working end of the chainsaw. It is not visible when holding the chainsaw. You will have to put it on the workbench and look at it from the bar-end of the chainsaw. The compulsory chain brake for kickback protection that’s activated by your backhand during a kickback action works well. This chainsaw has a lightweight and ergonomic design. It only weighs 12.2 pounds, it is easy to handle and is controllable in a kickback situation. The low kickback Oregon bar and chain is an additional aid in minimizing kickbacks. When the trigger is released, a motor brake device stops the chain. The trigger can be used to vary the speed of the motor. A switch lockout prevents unintentional operation of the switch until it is manually actuated. This chainsaw is not fitted with a metal spike bumper but has a ribbed bumper as part of the body. The ribs are used when felling or bucking to pivot the saw and to aid in holding it in position while sawing. Clearly, a spiked metal bumper is more effective and provides more grip. I’m disappointed that a metal spike bumper is not used, it’s a valuable aid. Included in the package are the DCCS670 brushless chainsaw, one 60V MAX 3AH battery, a DCB115 4ah charger, and a bar scabbard. Remember that the battery pack is not fully charged when removed from the carton. I recommend that, before using the battery pack and charger, you should read the safety instructions and follow the recommended charging procedures. As one owner pointed out, an advantage of using electric power is that it is available when the trigger is pulled. After every cut the chainsaw is put aside, then you examine the next cut. Unlike with a gas saw, there is no pull start, no heat, and no noise. You simply pick up the chainsaw and carry on with the work. There is no possibility of being scalded by the hot gas engine, and no gas changes to be concerned with. Without the loud noise of a gas engine, it is easier to concentrate on being safe and getting the job done. The DEWALT chainsaw is backed by DEWALT’s 3-year limited warranty. T90 Battery (90 watt-hours) provides up to 40 cuts of 6″ x 6″ timber in a full charge. Like the DEWALT, the Toro PowerPlex 51880 is a cordless chainsaw with a powerful brushless motor. This one uses a 40V MAX, 2.5AH Lithium Ion battery. It’s fitted with a 14-inch Toro bar and chain. One user reported that he used the Toro chainsaw to remove an elm tree with a 7-inch trunk that was about 25 feet high. Then he cut it up into 16-inch lengths and managed to do it all with one charge. It gives us an indication as to how useful cordless chainsaws can be. Especially considering that the Toro PowerPlex is less powerful than the rest of the electric chainsaws reviewed. According to the manufacturer, it should do 40 cuts of 6″ x 6″ pressure treated pine wood. Compared to the additional 30 cuts you get from the DEWALT Flexvolt, this isn’t the best. A series of LED lights on the back of the battery indicates the charge when you press the button. It helps you to swap batteries in time, but it can easily be overlooked because you have to press a button to see the charge. When you order the Toro PowerPlex online, you receive the 14″ Cordless Chainsaw with a 2.5 Ah Battery & Charger Included. The brushless DC motor used in cordless tools deliver more power than the normal brushed motors. Because no brushes are running against a commutator, friction is limited to the two bearings. It not only ensures more run time from the batteries, but brushless motors last almost indefinitely, as long as the bearings hold up. Brushless motors run a lot cooler than brushed motors, so it is easier to seal the motor against dust. The automatic chain oil dispenser has its oil level indicator window beneath the filler cap. It is visible while holding the chainsaw. Bar & chain oil is not supplied with the kit, you have to buy this separately. The amount of oil delivered to the chain and bar is not adjustable. To see if the chainsaw’s bar oiling system is still functional, you should inspect the bar and chain. Another option is to hold the chain close to a white surface like a used newspaper and run the motor. It should throw oil onto the paper. Adjusting chain tension on this Toro chainsaw is quickly done by turning knobs with your fingers. No need to fetch or carry a tool. The Toro has a low kickback bar and chain, which makes sense if you think that many users won’t have the most experience using a chainsaw. A fully functioning chain brake is fitted behind the top handle. I like the bold metal bucking teeth on this chainsaw. It is an additional safety feature that also aids in positioning the saw against the wood. The warranty period is a generous 3-years on the tool and 1 year on the battery. Toro is an American company with a strong network of professional distributors, dealers, and retailers in more than 125 countries. X-Torq Engine: Designed to reduce emissions while providing lower fuel consumption. The Husqvarna 455 Rancher is supplied with a 20-Inch bar and chain, but recommended bar lengths range from 15 to 20-inches. This professional chainsaw is ideal for a landowner who considers himself to be a part-time chainsaw user. It is a well-known and trusted chainsaw that can be used for all felling, bucking and clearing on the ranch or large wooded real estate. It says “Farm tough” on the bar, and it is. There’s a point that needs clarifying, some sites incorrectly list it as having tool-less chain tensioning. This is incorrect, the Husqvarna 455e Rancher has the tool-less chain tensioning, not this one. With the 455 you will receive a handy tool that you use to make the chain adjustment. This 455 chainsaw is powered by a 55.5cc Husqvarna X-Torq engine, with a power output of 3.49 HP. The 455 can cut through an 18” log in under a minute without getting bogged down, which is pretty impressive. Starter cord Resistance is low, and the air purge ensures that the fuel is free of air for quick and easy starting. With the engine running, you will realize that vibrations from the engine are very well dampened. There is a convenient fuel window on this model to see how much fuel is left in the tank. The combined choke/stop control controls the choke and the fuel shutoff. The Husqvarna air injection system is turbocharged to remove larger dust/debris particles from the cooling air by centrifugal force. It not only keeps the engine cleaner it also reduces air filter cleaning and greatly extends engine life. This lightweight and efficient all-round chainsaw for real estate owners is exceptionally easy to start and maneuver. There is no real need to yank as abruptly as usual. The X-Torq engine has low fuel consumption and emission levels. I find the size of the fuel tank to be rather small, it only holds 0.80 pints. Using full power, you will need to refuel it every 30-40 minutes. A SmartStart feature helps you to start the engine. You depress the Decompression valve to reduce the pressure in the cylinder to make starting easier. Once the engine has started the valve will automatically return to its original setting. It greatly reduces the effort needed to start the engine. What is the best chainsaw for someone who wants a small gas chainsaw to fell small trees, cutting firewood, and limbing fallen trees? This is a perfect small gas chainsaw for all of your cutting needs around the home. Also, a good size chainsaw for cleaning up after a hurricane or a storm. Highly effective turbo intake air cleaning technology. 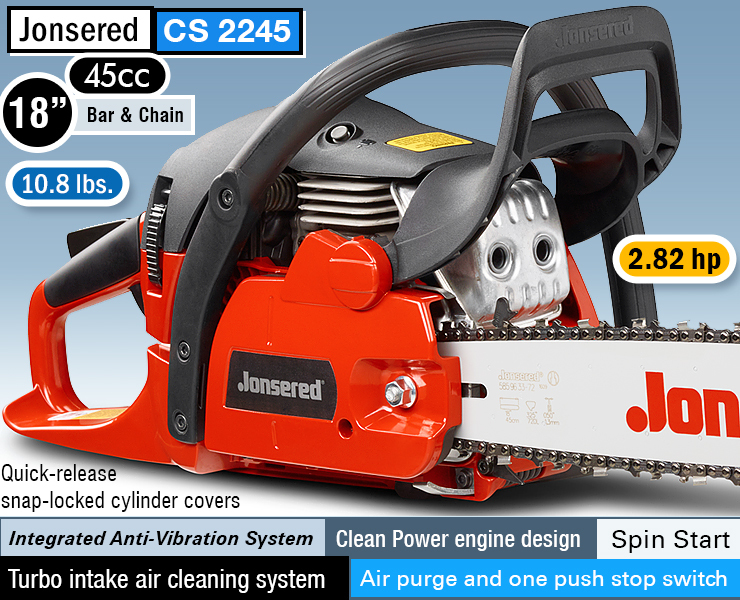 The Jonsered CS2245 gas chainsaw is sold with an 18-inch Jonsered bar and chain. It’s an all-around chainsaw powered by a 45cc 2-Cycle Jonsered Clean Power engine that delivers low emission levels. It’s also low on fuel consumption and produces high torque levels over a wide rpm range. It has a starting aid called Spin Start that uses a spring-loaded stop switch. Interestingly, the manufacturer warns in the user manual that the engine can be started with a low-speed pull and force on the starter rope. Warning that even small children, under certain circumstances, will be able to start the engine. It has the same type of air purge and one push stop switch used on the Husqvarna. It even looks the same. It’s no surprise then, that Jonsered is a Swedish brand. Jonsered produces products like chainsaws, trimmers, lawn mowers, garden tractors, and accessories. It was sold to Electrolux and production of chainsaws was later moved to Husqvarna. Husqvarna still maintains an R&D unit at Jonsered. I noticed that the Jonsered chainsaw is also incorrectly advertised as being equipped with a tool-free chain tensioner. Like the Husqvarna, another model, the CS 2245S, is equipped with one. The CS 2245 has a side-mounted chain tensioner that is also adjusted with a tool similar to the Husqvarna. The visible fuel level window, close to the filler cap, assists you in maintaining the fuel level. The Jonsered engine is a 2.79 cubic-inch two-stroke engine that delivers 2.1-kilowatt power. Jonsered’s claim to fame is that the clean-power engine technology reduces harmful exhaust emissions. It increases fuel efficiency and delivers more power at low speeds. The turbo intake air cleaning technology removes up to 97% of sawdust and dust particles to keep the engine cleaner. It uses centrifugal forces to separate debris and sawdust from the air before it reaches the air filter. In doing so, the air filter needs less maintenance, and the machine is easy to keep clean. To simplify maintenance, they use quick-release cylinder covers that quickly unclip with no need to undo any screws. This means that you can get to the air filter and spark plug quickly and easily. To minimize vibrations and reduce operator fatigue on long work days, the chainsaw handles are insulated from the working end with steel springs. Why does it matter if your chainsaw has anti-vibration technology or not? Well, our bodies can handle a little vibration but if you’re repeatedly using tools that vibrate you are in serious danger of developing hand-arm vibration syndrome (HAVS) — an industrial disorder that affects the blood vessels, nerves, muscles, and joints, of the hand, wrist, and arm. Most casual chainsaw users don’t have to worry about this, but if you do use a chainsaw (or other vibrating tools) then you need to use tools with built-in anti-vibration technology. The Jonsered CS2245 is ideal for extended homeowner use. It’s a great all-around chainsaw that’s perfect for felling and pruning trees or cutting large amounts of firewood. At 10.8 pounds it’s lightweight, and with the renowned quality of Husqvarna and Jonsered, it’s sure to be a top quality chainsaw. It’s a pity that gas chainsaws are so loud and hot. The Jonsered is louder than a rock band with its 115dB sound levels. The noise and gas engine maintenance issues, combined with the problem of managing gas supplies, compares unfavorably to the easy maintenance of electric tools. Jonsered makes a wide range of chainsaws, depending on your needs and budget. So, if you want to explore additional models, don’t worry, there are many options for you to consider. What is a sprocket nose bar? A sprocket nose bar has a sprocket wheel at the nose of the bar to reduce the friction of the chain running over the nose. It’s called a sprocket nose bar and those without one are generally referred to as hard-nose bars. A hard-nosed bar does not have the sprocket wheel at its tip. Usually preferred in gritty, difficult conditions and when cutting dirty wood which might jam the sprocket. A bar with 10 teeth or less is considered low kickback bars due to the reduced tendency to kick back. Bars with more than 10 teeth have better cutting performance than low kickback bars. Homeowner chainsaws and most general purpose chainsaws are normally fitted with low kickback, sprocket-nosed bars. Sprocket nose guide bars need a little more maintenance. You need to grease the sprocket wheel regularly to prevent it from seizing up. The user manual of your chainsaw will have detailed instructions on doing that. The size of the bar required will depend on the type of cutting you are planning to do. If, for example, you intend to use it for light pruning, you’ll select the shortest bar that the chainsaw can accommodate. It will reduce the weight and will enable you to maneuver the saw better and get into tight spaces. For felling or bucking, the longest bar your chainsaw can accommodate will enable you to cut through larger diameter wood in a single pass. The longer bar increases friction, and therefore there is a limit to what the chainsaw can handle. Bar sizes from 16-inches to 18-inch are more suitable for small to medium duty tree cutting and removing tree limbs. They are also good for storm clean-up. Gas chainsaws with a bigger engine can use 20-inch to 24-inch bars. These are suitable for firewood and large tree cutting. Bar lengths on professional chainsaws are normally from 20-inches to 48 inches.